We all know it’s expensive to have a baby. In my own experiences of nearly drowning in pre and post birth doctor and hospital bills, I’ve learned it’s impossible to avoid a lengthy list of charges for things I didn’t realize I could be charged for at the time — such as an extra diaper or even the use of a ‘patient belongings bag’ (yes, that’s a real charge). There’s literally a fee for everything, as one couple recently discovered on their itemized bill for a C-section. 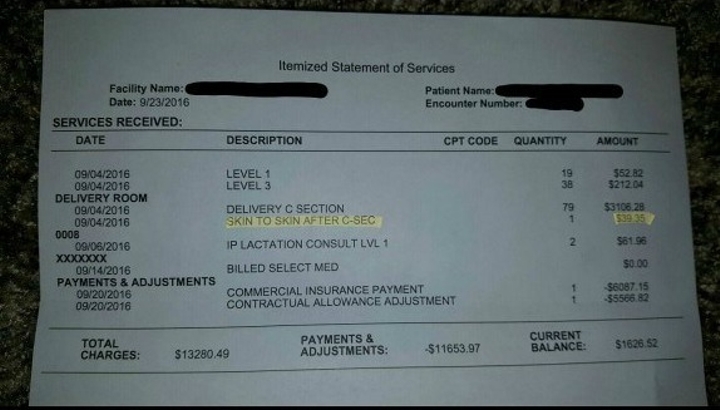 The typical charges are listed in the photo above with one unbelievable item added — the fee for “skin-to-skin contact after C-section.” In other words, these parents were billed $39.35 for—get this—holding their baby! Surely this is a mistake, as the request to hold one’s newborn can’t possibly be an actual charge, can it? The confused father took to Reddit to post the absurd proof, hoping others would agree that this is something that shouldn’t be happening to them, or any parent. "During the C-section the nurse asked my wife if she would like to do skin to skin after the baby was born. Which of course anyone would say yes too. We just noticed it in the bill today. The nurse let me hold the baby on my wife's neck/chest. Even borrowed my camera to take a few pictures for us. Everyone involved in the process was great, and we had a positive experience. We just got a chuckle out of seeing that on the bill." With the bill having gone viral in just 24 hours (to date it’s gotten over 5.7 MILLION views), everyone is weighing in, including a fellow Reddit commenter with her take on the mysterious charge. "As a labor and delivery nurse, I can kind of explain this. I didn't know that hospitals charged for it, but doing 'skin to skin' in the operating room requires an additional staff member to be present just to watch the baby. We used to take all babies to the nursery once the NICU team made sure everything was okay. 'Skin to skin' in the OR is a relatively new thing and requires a second Labor and Delivery RN to come in to the OR and make sure the baby is safe." We’re not sure if that makes the charge justified or not, but at least we now understand why it’s there. Regardless, we hope this won’t make parents think twice about choosing to hold their newborns immediately after delivery.